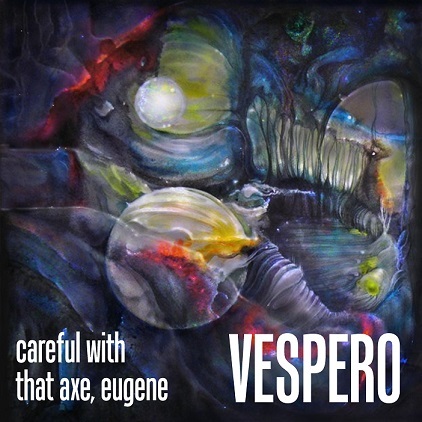 The latest from Russian space rockers Vespero is a 2-song 7″ on which they take on two Pink Floyd instrumental classics – Careful With That Axe, Eugene and One Of These Days. Eugene is suitably atmospheric, with lots of cool spacey effects, Mellotron (or Mellotron sounding), organ, spaced out guitar licks, and rockin’ solos, though it doesn’t deviate dramatically from Floyd. One Of These Days, on the other hand, is taken in interesting, different directions. Whereas the Floyd version is hard rocking intensity, Vespero for much of the track are more exploratory, heavier on the electronics, and get into some freaky experimentation. The big meltdown comes later in the piece and Vespero rock hard, though the slide doesn’t gnash its demon teeth like Gilmour did. But I like it when bands doing covers take the original in new directions and overall I like what Vespero did with the song. The single will be available mid-November, and as usual this is vinyl ONLY, no CDs or downloads. If interested you better hurry because Fruits de Mer releases sell out QUICK!